On the afternoon of December 5 at Air Force Station Bidar Air Marshal Kulwant Singh Gill AVSM, YSM, VM (G) ADC, Air Officer Commanding-in-Chief of the Central Air Command flew a three aircraft close formation sortie on Hawk Mk132 with his son, Flying Officer Shahbeg Gill, also part of the same formation. 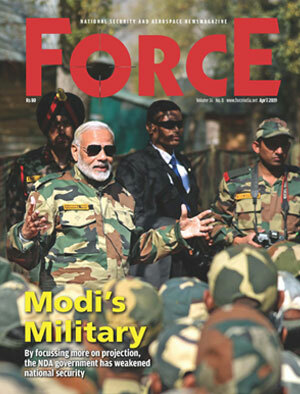 The Indian Air Force (IAF), in its statement, termed the event as a historic moment for the force. The three aircraft formation took off at around 3 pm and landed after approximately one hour. When Air Marshal was asked how he felt flying a sortie with his son, he said that it was a proud and memorable moment for him. Furthermore, he expressed his wish “to see more brave sons of this great land to opt for flying and fighting for nations”. When the father and son duo landed after the sortie, Ranjit Gill, Shahbeg’s mother was emotional, and said, “The two dearest people to me in this world have flown together in close formation and I cannot describe my feeling in words, obviously I feel I am the proudest wife and mother”. Air Marshal Kulwant Singh Gill was commissioned into the Flying Branch of the IAF in December 1977. In a career spanning 38 years, he has held instructional, directional and command appointments, including commandant of the National Defence Academy (NDA). He has more than 7,000 hours of accident/incident-free flying experience to his credit. Air Marshal Gill has rich experience of having worked on different assignments in India as well as abroad. He has had the distinction of commanding various front-line bases of the IAF and also has the distinction of being the contingent commander for the first United Nations mission to Congo. He has been the directing staff at Air Force Academy, Hyderabad. While commanding the IAF station at Leh (the world’s highest air field), he was instrumental in re-commissioning of two airfields. During his command, Air Force Station Leh was declared the ‘Pride of Western Air Command’. As Air Vice Marshal, he was the Senior Officer In-charge Administration (SOA) of Eastern Air Command. Air Marshal Gill is a thorough professional and has carved a niche for himself in almost all the posts that he has held so far. Air Marshal KS Gill is a highly decorated officer. For the distinguished service and exceptional professionalism, he has received three Presidential awards. In his earlier days, he has been the member of the 7th and 8th Antarctica Expedition wherein for displaying extraordinary courage he was awarded the Vayusena Medal (Gallantry) in 1990. Yudh Seva Medal in 2005 and Ati Vishisht Seva Medal in 2010. Air Marshal Gill hails from Patiala, and had commanded air force station Patiala from 1999-2001. He is an alumnus of Mahendra College. Air Marshal Gill is married to Ranjeet who is a home-maker. The couple has three children, two daughters and a son. His son, Flying Officer Shahbeg Gill, is undergoing stage-III training in the fighter stream. Flying Officer Shahbeg has done his matriculation form St Peter’s School, Patiala and high school from Army Public School, Patiala. From childhood, Flying Officer Shahbeg wanted to be like his father and with the sortie he has taken a major step towards that.